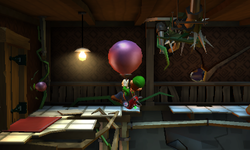 The Lounge is a room inside the Haunted Towers in Luigi's Mansion: Dark Moon. The Lounge can be accessed only by using the Bulbs in the Laboratories to float to the top floor. The Lounge is destroyed and only a few tiles of flooring remain, but for the most part, it is covered in thorny vines and large roots. The Lounge has cream-colored armchairs and there is hole in the wall that shows the Conservatory. The left door takes Luigi to the Water Supply. During B-1: A Job for a Plumber, Luigi needs to make his way to the Lounge and avoid the thorny vines. When he gets to the top, he must go through the door and into the Water Supply. This page was last edited on May 1, 2017, at 21:11.